Outdoor Pros’ commitment to quality and affordable landscaping installation and maintenance is among the many reasons we provide some of the most all-inclusive and quality landscaping Wake Forest NC services in the area. From seasonal residential jobs to comprehensive commercial redesigns, we can tackle any size project efficiently and effectively. For over 25 years, Outdoor Pros has provided quality and affordable turf care and maintenance. Our clients consistently tell us that their lawns are not only the best looking, but also the healthiest in the neighborhood. Historically, we have only been able to offer turf care to our full-service landscape clientele. However, Outdoor Pros recently began offering a service called Turf Pros. The comprehensive turf care installation and maintenance plan utilizes some of the most current weed, fertilization and pest control techniques available today. Are you worried about harmful chemicals? Not when you work with us! Some Turf Pro custom plans feature organic turf that will make your lawn the envy of the block! Also, Turf Pro fertilization and pesticide techniques have been licensed by the North Carolina Department of Agriculture and Consumer Services. Which means the application of pesticides and fertilizers to your trees and shrubs is done to the highest of standards. Turf care is just another reason why Outdoor Pros offers the best landscaping Wake Forest NC services in the surrounding area. Outdoor Pros is more than just a landscaping Wake Forest NC company. We also offer beautiful, affordable and sturdy hardscaping structures that will transform your property into an outdoor oasis. Are you in need of a new patio, grilling area, outdoor kitchen, or retaining wall? Outdoor Pros has you covered! When you work with our team, any backyard is ready to be converted into an extraordinary getaway. Choose from a variety of patio colors, textures and layouts when designing your dream space. 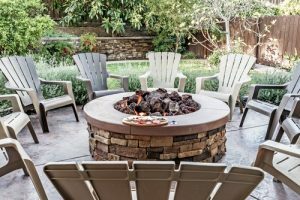 Outdoor Pros will work tirelessly to make your backyard patio a hot spot for parties. Or we can design it into a relaxing personal haven. Need something a bit more practical? The experts at Outdoor Pros can also install sturdy and ascetically appealing retaining walls that will maximize your outdoor space and control for erosion. Don’t stand for subpar craftsmanship. Outdoor Pros is certified by the National Concrete and Masonry Association, which means that we meet strict national standards for the installation of any size retaining wall. Contact us to learn more information about our landscaping and hardscaping packages, or receive a free quote today!